September 19th 2014 9:00am-5:30pm the Columbia Institute for Tele-Information, in collaboration with IDATE, France presents the annual conference on the State of Telecom at the Columbia Club, NYC. This year’s event has the theme From the Internet of Science to The Internet of Next Generation Entertainment: Implications for Content, Technology and Industry Consolidation . 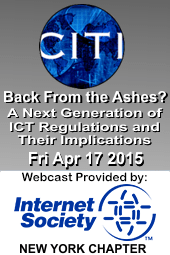 The event will be webcast live via the Internet Society livestream channel. Where: Columbia Club, 15 W. 43rd Street, New York, NY 10038. Today Monday February 11 2013 from noon til 2pm the Columbia Institute for Tele-Information (CITI) will host a webinar What’s Next After The Collapse of the ITU’s WCIT-12 Dubai Talks. Particpation is free but there is 200 person limit. Are we, as The Economist says, at the beginning of a “digital cold war” between signatories and non-signatories? What would the implications of a “cold war” scenario be for the future of the Internet? Or, alternatively, are we dealing with a “too much about nothing” scenario, where after ratifications and delays, little would have changed? How has the conference affected the future of the ITU? Will a split regulatory scenario of the Internet affect its regional implementation? The Columbia Institute for Tele-Information (CITI) and the Media Center at New York Law School present d The National Broadband Plan: A Roundtable Discussion on Monday, April 19, 2010 at 1 p.m. I get in the very last question, on structural separation, at 3:33:48 or so..